In the town of Bet El where the story of Jacob's dream took place, something happened in the last forty years that many in Israel and the world are unaware. In a special video dedicated to a day of fundraising, Bet El Yeshiva Center is unveiling "a ladder set up on the ground and its top reached to heaven" and the tremendous connection between the spiritual and material world in this one place. At the Bet El Yeshiva Gevoha 350 students from all over the country are currently studying in its newly built Beit Midrash. Thank G-d, the yeshivah has grown in recent years in quantity and quality, efforts are now toward building dormitory space to meet the ever growing number of new students. The Yeshiva Gevoha (Bet Midrash) has raised a generation of alumni dedicated to Torah and Avoda, country-wide, among their ranks: Roshei Yeshiva, Dayanim, yeshiva rabbis, businessmen, Knesset members, men of action whose days are filled with Torah and work, together with Derech Eretz and the Fear of Heaven. The Bet El Yeshiva Center is not satisfied with simply studying Torah in the Beit Midrash, therefore, over a decade ago, they established the The Yeshiva Online Campus -- Center for Worldwide Torah , one of the pioneer Torani sites on the web, in effect, the largest yeshiva in the world where 500,000 individuals the world over who visit each month and enjoy over 40,000 lessons available online, live broadcasts, quick and concise answers to their halakhic questions in a multitude of languages at all hours of the day. The site aims to touch every Jew the world over, and this is not a cliché. Every week, the site receives exciting stories about visitors who use the website in order to get closer to Judaism, to strengthen in Torah and mitzvot, and more. The website staff works day and night to keep the site fresh with new material adjusted for all levels of understanding.Each donation will help spread Torah and strengthen Judaism in Israel and around the world. Around 20 years ago “Bnei Tzvi” Yeshiva High School in Bet El was founded, its aim, to Torah studies at the highest level, along with a complete array of secular studies. Over 200 students learn at “Bnei Tzvi.” In the last few years interest in the yeshivah has grown so much, to meet needs the yeshiva is housing students in temporary prefab dormitories with en eye on a new school to commemorate two graduates - Shalom Shreki, who was also a yeshiva instructor, and David Golubenitz, who were killed in an IDF operation in Hebron. “Bnei Tzvi” Yeshiva High School is calling on the general public to help build the new boarding school. One of Bet El Yeshiva Center’s most inspiring institutions is the Bet El IDF Prep Academy. This prestigious academy with over 150 students is intended for high school graduates who come to strengthen themselves in body and soul in preparation for their IDF military service. The academy is a central part of Bet El Yeshiva Center’s institutions and the vision of its founder, Rabbi Zalman Baruch Melamed, sees the academy as an inseparable part of building as expressed through the love of Torah, the people, and Eretz Yisrael. The fundraising day will be for the benefit of the Bet El IDF Prep Academy’s students and its crowning glory will be the construction of a new campus and a permanent structure for dorms, which have been in temporary housing for over 15 years. An inseparable part of Bet El Yeshiva Center’s enterprise for the last 26 years is the Gluck Girls Ulpana High School, where, 400 students study and thousands have graduated. At the head of the ulpana is Rabbi Haim Sultan and a veteran teaching staff. One of the unique aspects of the ulpana is the connection with the girls continues through through their national service, academic studies, career selection, and family building, in all stages and challenges of their lives. This special fundraising day is aimed at establishing a fund for the ulpana’s alumni to meet their various needs, e.g., funding for studies, loans, and special needs. 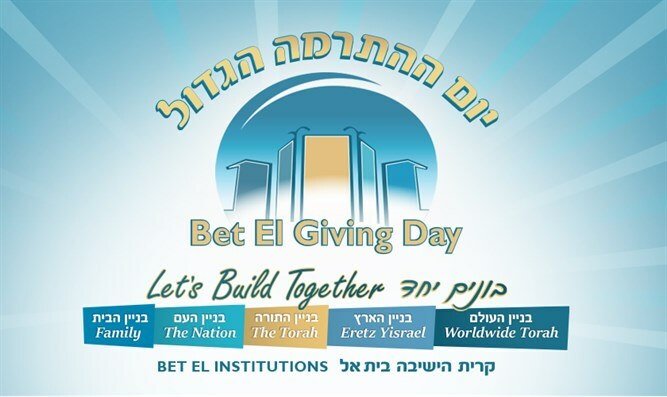 “Bet El Giving Day” will be held by the Charity Company using the all-or-nothing method, starting today (Wednesday) at 4PM every dollar donated by the public will be matched, multiplied three times by friends of Bet El Yeshiva Center in Israel and and abroad. If our fundraising goal is not reached, Bet El Yeshiva Center will have to return all donations. We call upon the general public to be part of this important enterprise. We at Arutz 7, which grew out of the The Yeshiva Gevoha (Bet Midrash) in Bet El with the goal of promoting the positive ideals of Bet El Yeshiva Center throughout the country and the world, call on the general public to lend a hand to this tremendous enterprise of which we are a proud to be part. The special path of Rabbi Zalman Melamed, effort in building the world of Torah, Family, the Nation, Army, Eretz Yisrael, and Binyan Olam, is a tremendous challenge and the general public is invited to take part.